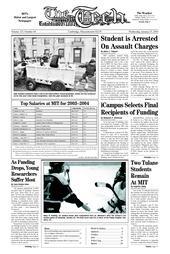 MIT graduate student Dong Zhang was arrested last month and charged with assault and battery of his ex-girlfriend, who is also a student at MIT. He faces three counts: assault and battery with a dangerous weapon, assault and battery, and threat to commit a crime. Assault and battery with a dangerous weapon is a felony charge in Massachusetts, and if found guilty, Zhang could face a maximum of 10 years in state prison. Two of the 10 students hosted by the Institute last term after their universities were temporarily shut down by Hurricane Katrina are staying on for at least another semester, with at least one hoping to permanently transfer to MIT. The physics department at MIT accepted only 25 graduate students this year, down from 50 in years past. Several job candidates turned down the prestigious school for work in other countries where science funding is considered more stable. And two MIT contracts with NASA — that PhD candidates rely on to pay for their work — were trimmed by 91 percent. When Republican senators quietly tucked a major new student aid program into the 774-page budget bill last month, they not only approved a five-year, $3.75 billion initiative. They also set up what could be an important shift in American education: for the first time the federal government will rate the academic rigor of the nation’s 18,000 high schools. A 24-year-old conservative alumnus who announced earlier this month that he planned to pay students at the University of California, Los Angeles, to tape-record the lectures of left-leaning professors backed down after U.C.L.A. officials informed him on Monday that he would be violating school policy. The following incidents were reported to the Cambridge and/or MIT Police between Jan. 9 and Jan. 20. This summary does not include incidents such as suspicious activity, false alarms, general service calls, or medical shuttles.